Vendu par A ENTERTAINMENT et expédié par Amazon. Emballage cadeau disponible. Commentaire: Entierement garanti. Expedie a partir du Royaume-Uni, veuillez noter que l'acheminement peut prendre jusqu'a 14 jours. In this five-part series, actor Ross Kemp travels with his father's old regiment to Helmand Province in Afghanistan to experience firsthand the fight against the Taliban. Filmed during the summer of 2007, the series shows in detail what life is like for the British forces and pulls no punches in its depiction of war and the effect it has on families back at home. The hugely acclaimed series from Sky makes its way to DVD, and if you havent checked in with it already, then this is the ideal opportunity to see what the fuss surrounding Ross Kemp in Afghanistan is all about. Kemp, of course, is still primarily known for playing Grant Mitchell in EastEnders. But here theres no fiction: Ross Kemp in Afghanistan sees him joining his fathers old regiment - 1 Royal Anglian - to get first hand experience of the work of the British Army in the fight against the Taliban. 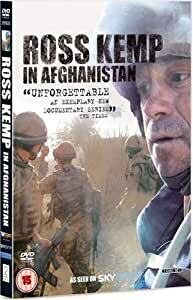 What differentiates Ross Kemp in Aghanistan from the news reports and documentaries that have also tackled similar subject matter is the sheer candidness of it. Theres no hiding the brutality of war, or the intensity of the fighting here. Some of the footage is quite extraordinary and frequently shocking. And you can hardly accuse Kemp of shirking the action: hes often slap-bang in the midst of it.